AN ENTIRE STREET in Clonmel, a Centra store in Dublin city centre, and Dartmouth Square, the much-disputed square in Ranelagh in Dublin, will be among the lots going under the hammer at today’s Allsop auction of distressed property. A total of 109 lots will be up for sale at the auction, including 55 commercial properties and 54 residential properties. 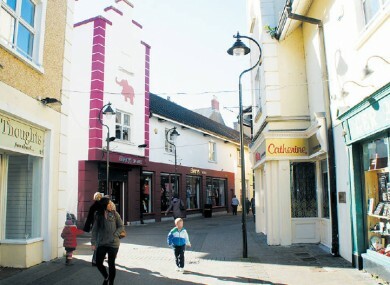 Market Place in Clonmel – which is made up of 18 buildings, nine of which are vacant – has a reserve price of €900,000. The unit brings in an annual rental income of more than €230,000 per year. Dartmouth Square in Ranelagh which was the subject of a dispute after it was bought by controversial businessman Noel O’Gara in 2005, is for sale with a reserve price of €140,000. A retail outlet currently occupied by Centra on Capel Street in Dublin’s city centre is for sale with a reserve price of €550,000, while a two-bedroom apartment in Leitrim has a reserve price of just €15,000. The last Allsop Space auction took place two months ago at the start of October. As with previous distressed auctions, the vast majority of properties sold, with most properties going for prices far in excess of their reserves. Previous sales have seen a convent in Tipperary sold for €115,000, an entire housing estate in Kerry sell for €235,000, and a castle in Kildare selling for €195,000. Robert Hoban of Allsop Space said there has been increased interest in commercial properties as people seek to set up businesses again or look for commercial investment opportunities. Today’s auction is believed to be one of the biggest auctions of commercial properties ever held in Ireland. The auction begins at 10am in the Shelbourne Hotel on Dublin’s Stephen’s Green. Email “Entire street in Tipperary among lots for sale at distressed property auction”. Feedback on “Entire street in Tipperary among lots for sale at distressed property auction”.